It's a litte embarrassing, in some respects, to admit how long I've been taking yoga. Embarrassing because in all these years, I haven't gotten much better at it. Sure, I've improved my alignment, developed (and lost and developed and lost) strength and balance. But I hit a plateau a while ago that I haven't bothered to do anything about. Like anything else, you have to practice in order to get better at what you know, and you have to have someone teach you things you don't. And when you don't go to class very often, and you don't have a good home practice, there's not much hope for you. I've been thinking lately about how I miss learning new things. I put a lot of mental energy into my job and my family, and sometimes I find it hard to think outside of those boxes. But I know that it's possible: I have plenty of positive role models, even among friends, people who have taken pottery classes and picked up quilting and wrote novels and trained for marathons. And I'm not an old dog yet. It's true, I can read more CSS code than I used to. And I can read more French than I used to. And I've been practicing my headstands, ever since last summer, though I haven't yet succeeded to get myself upside down in the middle of a room. I went to a yoga class in town last night. Not the studio where my favorite teacher practices (which is, sadly, a 20 minute drive and only really do-able on occasional weekends), but someplace local that I can walk to. Everyone in class seems to know each other, which felt a little weird. And they talk through the entire class period, which is also a little weird. But I like the teacher well enough. She's down to earth, and has a good sense of humor. And last night she told the class to do flying lizard. Which apparently everyone knew how to do but me. Then, you crawl your forward leg up around your shoulder (or put your shoulder under your forward leg), and you bend your other arm to support the other half of your body, which is going to fly as you lean forward just a bit (at right). The model at right is not leaning forward. But I was. Because I don't have that kind of core strength. Go, model. At first, I wobbled a lot. I fell over. I decided there was no way in hell that my back leg was going to float off the floor. The woman next to me, who was older and looked--on first sight--like she was less in shape than I am, did it beautifully. And then assured me that if I did it again, I'd be able to do it, too. I wasn't going to try it again, but something about her assurance poked me a little bit. There was still time. Why not try again? And then everyone was looking, and up I went. Then the teacher told us all to practice fallen angel (devaduuta panna asana). Starting with a side arm balance, you allow your cheek to rest on the ground, stretch one leg to the sky, and fold the other up to your straightened leg. Not trivial. But I gave it a shot, and managed not to fall over immediately. The second time, I got my leg up in the air. It was a wonderful feeling, doing something new. I'd forgotten. And yes, as my husband pointed out, parenting involves learning something new every day, but there's something about this kind of learning that feels different. Good. Measurable. What have you been meaning to learn? What have you taught yourself lately? 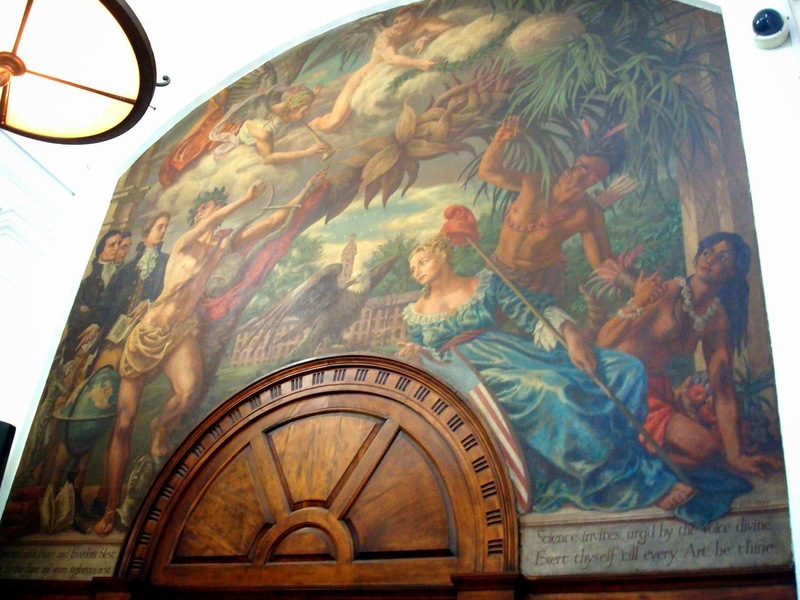 At the far end of the post office lobby in the town where I work, featured prominently for the viewing pleasure of people in the queue, there is a mural entitled America Under the Palms (1939). Painted in neoclassical style, the mural depicts Columbia, popular allegorical figure of the New World during the colonial period, recumbent in her traditional blue gown, holding a liberty pole hung with a liberty cap, leaning in conspiratorially to hear what tidings the eagle, front and center in the mural, brings. Behind her cower two Native Americans, arms raised to shield themselves from noisy heralds that point at them. To her left are three white men dressed in frock coats, surrounded by symbols of learning: a globe, books, classical busts. Our most well-known university building dominates the background. The mural is huge, and there's a lot going on. Considered in its entirety, it's fairly racist. It's a product of its time, of course. Perhaps it was meant to exhort University students and town residents to greatness in the service of their country. Or something. (Though I suspect that students haven't spent much time thinking about the message of the mural in the post office.) And racist as it is, the depiction of the white male Enlightenment taking over the "natives" in town is fairly accurate, though perhaps not as celebratory as the artist intended. "America! With Peace and Freedom blest/Pant for true Fame and scorn inglorious rest./Science invites, urged by the Voice divine,/Exert thyself 'til every Art be thine." The irony is that whenever I'm looking at the mural, I'm standing in line. I epitomize inglorious rest. And I find myself feeling a little annoyed at the whole idea of rest being inglorious anyway, given how my undergraduates treat busy-ness as a status symbol, and how that mindset often ends up sabotaging them. In fact, when I'm looking at that mural, I often realize that I have been completely immersed in the moment, completely present. Here I am standing in line, I think. Sometimes I consider what I'm going to do at work that day, or what's on deck at home. But most times, I'm really just thinking about standing in line. And waiting for the line to move, but also just knowing that there's nothing I can do to make the line move any faster, so I might as well just be there. I'm not playing with my phone, because that would involve holding the phone, and usually, when I'm standing in that line, I'm holding some sort of package that requires two hands. The post office is going to move to a new location soon. I'm not sure what they'll do with the mural, but I know that the queue just won't be the same. Is there art--even annoying art--in your life where you stand still? Cinco de Mayo has become an excuse to drink (one of the featured BlogHer recipe posts actually said "start with alcohol! "); to ignore some pretty terrible treatment of a large immigrant population; and to reduce the complexity of Mexican and Mexican-American culture to stereotypes, even in our schools. Most people seem not to know why it's even important. Cinco de Mayo is a commemoration of the Battle of Puebla, fought in 1862, in which a woefully underequipped Mexican army successfully repelled the forces of Napoleon III. Though they eventually lost the war, that battle was important because it marked a rare moment in history: a colonized people's resistance of a colonizing force. It wasn't even really celebrated much until the Chicano movement reclaimed the holiday in the 1960s, celebrating their own heritage and resistance to the colonizing forces of American culture. Which is sort of ironic, considering how the holiday itself has been colonized by people trying to make a buck, or people who have no particular connection to the culture. Our nation has come a long way on the backs of Mexican laborers. In my town, there are still men (some Mexican, and now also some from Central American countries like Honduras) who hang out at the convenience store, waiting to be picked up by someone who wants cheap help for a day job, so that they can support their families. There are also, as there were when I lived in LA, lots of immigrant laborers who work on farms in my county, and not always (or even often) for the best wages, or benefits. I'm grateful that I live in this small diverse corner of the universe. But I also see a lot of work to be done. A few nights ago, for example, a SWAT team came to my town to conduct a drug raid. Three blocks from my house. Social media went crazy. And blamed the "Mexican gangs" and "immigrant laborers." If we reduce Mexicans and Mexican-Americans to moustached drunkards, then it's going to be a lot easier to incarcerate them, underpay them, or treat them as less than human. I have no objection to celebrating Cinco de Mayo. My daughter's school held a celebration in the evening, which was the result of a month-long culture and arts unit with the Spanish teacher. Some of the elementary school students read the history of the holiday, and mentioned that it's celebrated here more than in Mexico. They sang "De Colores," a song associated with Mexican folklore which has been used as the unofficial anthem of the Farm Worker Movement. They made sarapes, shawl-like garments worn in Mexico by men, and rebozos, long flat garments worn by women, often folded or wrapped around the head and/or upper body to shade from the sun, provide warmth or to carry babies and large bundles. (The garment is considered to be part of Mexican identity and nearly all Mexican women own at least one.) They learned about the Mexican flag, made crafts of pyramids and el ojo de Dios. Yes, they ate beans and tortillas, because that was the most expedient way to feed a huge crowd of 2-6 year olds and their families. But that wasn't the focus of the event. Next year, I hope that there are some more nuanced posts about Cinco de Mayo. Maybe some that honor the real meaning of the holiday, and the role of Mexicans and Mexican-Americans and their culture in our own nation's history, rather than exhorting us to "start with booze." Did you celebrate Cinco de Mayo yesterday?